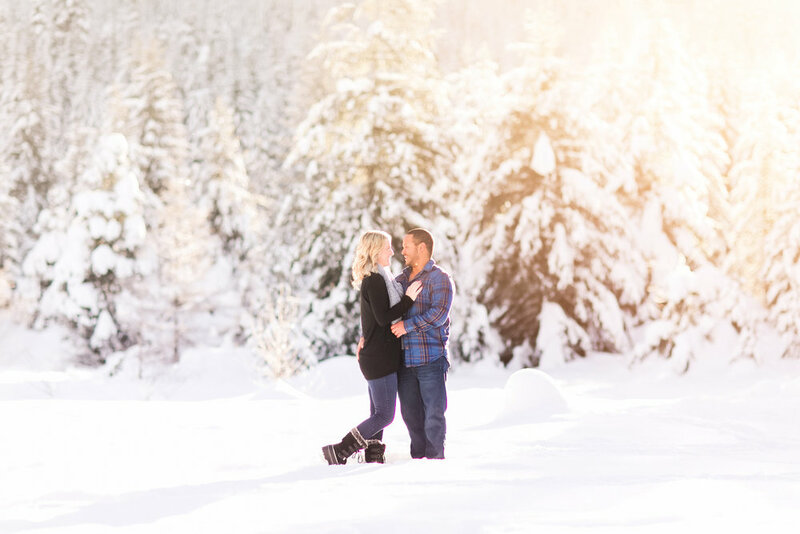 Take a moment to get to know these two and enjoy their snowy winter engagement photos from Rachel Howerton Photography! Tell us a little about yourselves individually (who you are, what you like, etc.)! Michaela is artistic and enjoys crafting and spending time outside whenever the sun comes out! Matt was in the Marine Corps for 6 years. He enjoy snowboarding and all water sports. Matt and I met through mutual friends and quickly realized how compatible we were. No matter what we would go do, rain or shine, we always found ourselves laughing and having a good time. I would say our style is laid back and casual. We enjoy entertaining for friends at our house and love spending time with our kids. We do enjoy dressing up for a more formal occasional as well! We really enjoy seeing all of our visions slowly come together! The more we get checked off of our list, the more excited we are getting for the big day. Just make sure to enjoy the process. When planning a wedding it can be stressful, but don't lose sight of the reason it is happening. Michaela loves sweets, and Matt isn't a big fan of them. But there is one dessert we can both agree on and enjoy: cheesecake! Filet Mignon and King Crab! We are looking the most forward to being married, but also to have our most loved family and friends all in one place celebrating our big day with us. Describe your fiancé in 3 adjectives. A big thank you to Michaela and Matt for choosing us to coordinate their wedding day! We are excited to kick off the planning process with you soon and give you a stress-free and seamless wedding experience! Thank you! Please click this link to access your guide!